Are you in need of some high-quality painting? You want professionals to do the job because you want the paint job to look flawless without paint splattered around on things that it’s not supposed to be on. If that’s the case, we can help you with professional interior and exterior painting in Scottsdale, AZ. Our services include helping you with paint selection, preparing for the painting process by protecting your belongings, and completing the job so that you’re happy with the outcome. With these few steps, we’ll have the painting completed for you in no time, leaving you impressed with the finished piece. During paint selection, we’ll show you all kinds of different colors and types of paint. Because there are so many different varieties, it’s important to know what is available for both interior and exterior painting in Scottsdale, AZ before making your decision. We want you to choose colors that you prefer, but if you need our expertise and professional advice, we’re always willing to assist. After picking out the specific colors and the type of paint that you want to have painted either inside or outside of the home, we can start prepping the area to ensure that paint doesn’t get on anything other than what it’s supposed to be on. While painting, we’re always careful because we want the job to look fantastic. You’ll have a painted section looks perfect instead of clumpy or watery. 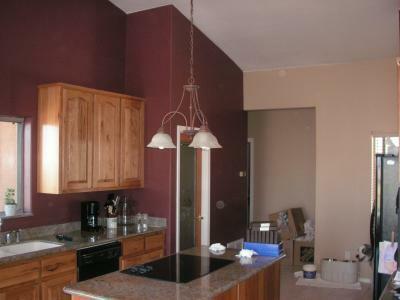 After we finish painting, we’ll have you take a look to confirm that you’re satisfied before we leave. Our professional painting services will take the frustration out of trying to do it yourself, saving you plenty of time and energy as well.